If you think your fitness tracker on your wrist is giving you a good excuse to eat that sweet treat, you may want to think again. A recent study from the Stanford University School of Medicine says fitness trackers are not accurate at tracking calories. The study says, however, that the trackers are accurate at measuring heart rate. The Stanford researchers examined measurements recorded when people were at rest and while they exercised. “People are basing life decisions on the data provided by these devices,” said Euan Ashley, one of the study investigators. They were Apple Watch, Basis Peak (version 1), Fitbit Surge and Microsoft Band (version 1). The others three were Mio Alpha 2, PulseOn, and Samsung Gear S2. Sixty participants of both sexes wore up to four trackers on their wrists as they sat, and as they exercised on a treadmill and a stationary bike. The participants were a mix of sizes and fitness levels. The trackers measured the heart rates and energy used, or calorie burn, in activities from sitting to a slow walk to a run. They also tested people cycling at different speeds. Professional medical instruments measured participants’’ heart and breathing rates as well as temperature and blood pressure. The researchers compared the fitness tracker measurements to those of the “gold standard medical instruments. In this March 1, 2017 photo, Jamey Powell, left, and Julianne Hough lead an exercise class as the participants are introduced to the Alta HR fitness tracker at Swerve cycling center in New York. The final report on the study was published last week. It found that none of the trackers met what researchers considered an acceptable error rate for energy use measurement. The acceptable error rate is five percent or less. The researchers wrote that the Fitbit Surge was the most accurate tracker of energy use. It had a 27.4 percent average error rate. The study found the PulseOn to be the least accurate tracker, with a 92.6 percent error rate. The error rate was higher for males than for females with all fitness trackers tested. The average error rate for all the trackers studied under all forms of exercise was four percent higher for males than for females. The good news is the tested fitness trackers were accurate at measuring heart rate. All but one of the trackers met the acceptable error rate limit in heart rate measurement. Of the trackers studied, the Apple Watch was the most accurate at measuring heart rate, with an average error rate of two percent. The Samsung Gear S2 was the least accurate with an average error rate of close to seven percent. 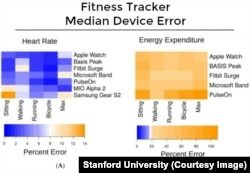 For both the measurement of energy used and heart rate, the researchers said “the Apple Watch had the most favorable error profile while the Samsung Gear S2 had the least." The Stanford researchers are continuing their investigation of fitness trackers. Next, they will test participants wearing fitness trackers during their daily lives and while exercising outside a laboratory. The full study is available online at The Journal of Personalized Medicine. The Journal of Personalized Medicine, Accuracy in Wrist-Worn, Sensor-Based Measurements of Heart Rate and Energy Expenditure in a Diverse Cohort. 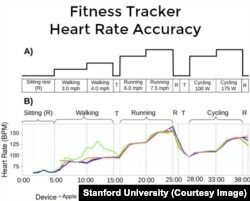 A summary of the study can be found at Stanford University News Center, Fitness trackers accurately measure heart rate but not calories burned. Carolyn Nicander Mohr wrote this report for VOA Learning English. Catherine Kelly Weaver was the editor. Do you wear a fitness tracker on your wrist? Do you think fitness trackers accurately measure heart rate and energy expended? Do you make decisions based on your fitness tracker? fitness tracker - n. a wearable device or a computer application that records a person’s daily physical activity, together with other data relating to their fitness or health, such as the number of calories burned, heart rate, etc.